She is right. Original research and reporting by the global journalism organization Orb Media shows a strong connection between how we view old age and how well we age. Individuals with a positive attitude towards old age are likely to live longer and in better health than those with a negative attitude. Older people in countries with low levels of respect for the elderly are at risk for worse mental and physical health and higher levels of poverty, compared to others in their country. A shift in attitude, the research shows, could improve a lot. Healthy ageing is increasingly important: countries everywhere outside of Africa are rapidly growing older. 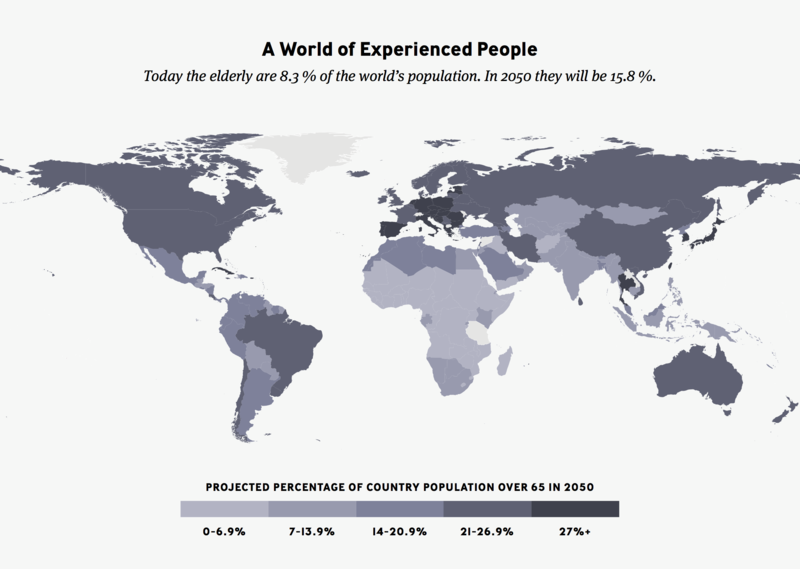 If population trends continue, by 2050 nearly one in five people in the world will be over 65. Close to half a billion will be older than 80. Smaller, young populations will have to care for large, older populations that have increasingly expensive healthcare needs. Surprisingly, in a world full of older people, negative views of old age are common. A World Health Organization analysis found that 60% of people surveyed across 57 countries had negative views of old age. Older people are often viewed as less competent and less able than younger people. They are considered a burden on society and their families, rather than being recognized for their valuable knowledge, wisdom and experience. 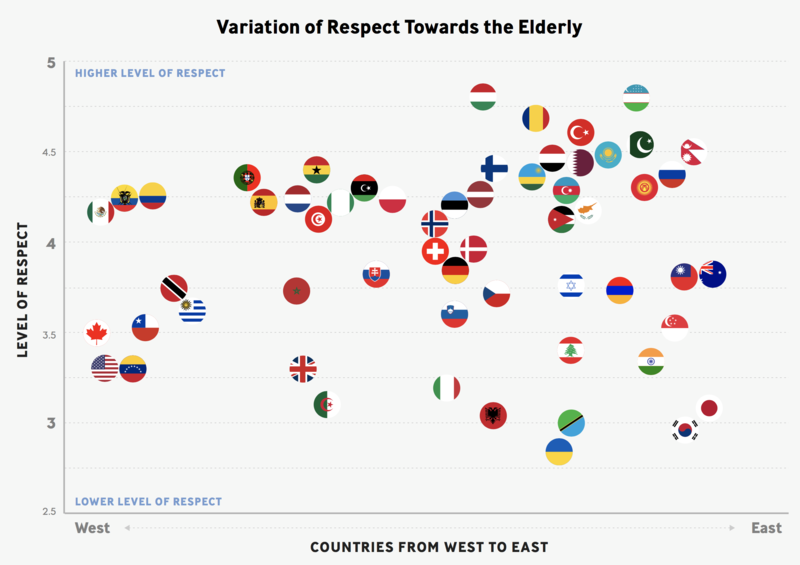 Orb Media compiled data from more than 150,000 people in 101 countries to learn about their levels of respect for older people. Pakistan was among the countries that scored the highest. Respect for older people is a long-standing tradition in Pakistan, says Faiza Mushtaq, an assistant professor of sociology at the Institute of Business Administration in Karachi. But as more people move to cities, traditional family structures are being disrupted, making it harder to care for elders. Without a government safety net, many older people fall into severe poverty, she says. Nonetheless, there are tangible benefits to the way elders are viewed, says Mushtaq. “This attitude towards ageing is a much healthier embrace of the ageing process, rather than having all your notions of well-being, attractiveness and self-worth tied so closely to youth”, she says. It turns out that one’s attitude towards ageing has broad implications. Becca Levy, a professor of epidemiology at the Yale School of Public Health in the US, has been fascinated by the power of age stereotypes for decades. She started her work in the 1990s with a hunch. If older people are respected in society, perhaps that improves their self-image. “That may in turn actually influence their physiology and that may influence their health”, says Levy, the leader in the field. Over the last two-and-a-half decades, Levy and other researchers that have followed have found just that: those with positive views about old age live longer and age better. They are less likely to be depressed or anxious, they show increased well-being and they recover more quickly from disability. They are also less likely to develop dementia and the markers of Alzheimer’s disease. In one study, Levy found that Americans with more positive views on ageing who were tracked over decades lived 7.5 years longer than those with negative views. Studies in Germany and Australia have found similar results. “Some of the magnitudes of the findings have been surprising”, says Levy. Orb’s research and analysis found that these effects can also be seen across cultures. 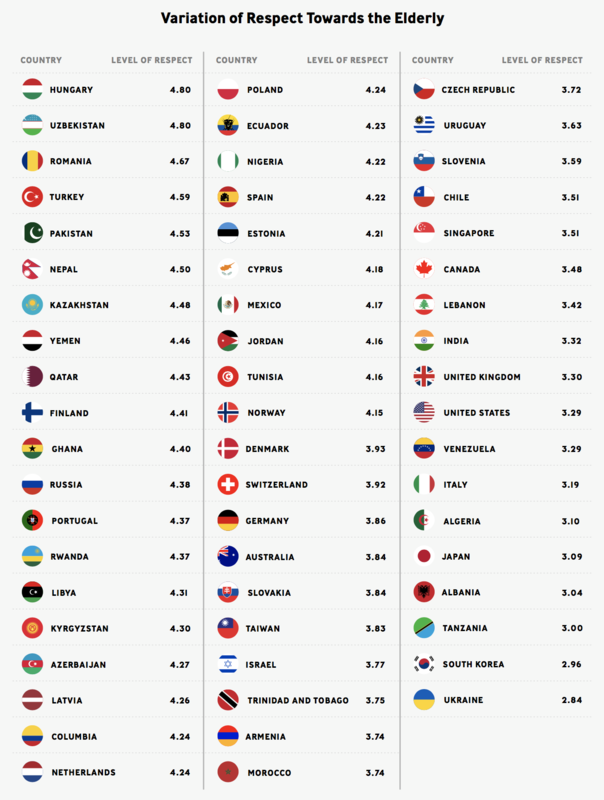 Older people in countries with high levels of respect for the elderly report better mental and physical well-being compared to other groups in their countries, according to data from the OECD, the UN and others. Those countries also report lower rates of poverty among people over 50 compared to younger people. It seems too simple. How can holding a better attitude towards old age help someone live longer? Levy found that people with negative age stereotypes have higher levels of stress. And stress has been correlated with a range of health problems. Those who expect a better life in old age are also more likely to exercise, eat well and visit the doctor, says Levy. That has been the case for 57-year-old Marta Nazaré Balbine Prate, who moved her family into her parents’ home in Sao Paulo, Brazil a decade ago. She had to quit her job as a nutritionist at a hospital to care for them. Her father passed away at the beginning of the year. It has been hard financially and emotionally. But, she says, the experience has made her think about the kind of life she wants when she is older. “I try to watch what I eat. I work out as much as possible”, she says, “so I can reach old age in good physical condition”. As people grow older, their health usually remains stable until about five years before they die, says Loeckenhoff. Only then will most people experience the mental and physical decline most associated with old age. “People keep mixing up ageing and dying”, she says. Some research shows that increasing meaningful contact between young and older people can break down negative stereotypes. For the last five years, the Résidence des Orchidées, a nursing home in Tourcoing, France has tried to do just that. Every week, the home brings children from a neighbouring daycare centre to visit the residents.